Boston Stake Relief Society is where women of different cultures and backgrounds form a loving community based on a shared belief in Jesus Christ. In Relief Society we focus on developing faith, nurturing families and providing relief to those in need. 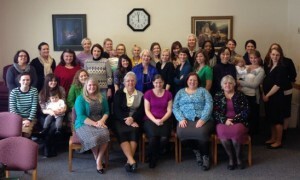 Relief Society sisters care for each other in many ways. We visit and teach one another in our homes and in Sunday meeting. We hold additional gatherings to build faith, learn new skills and form closer friendships. We want every woman in this community to know that she is loved and valued for her unique gifts. We strive to combine our gifts and talents to help mothers and families raise healthy and happy children and reach out into the broader community to provide humanitarian relief where needed. Our Boston Relief Society seeks to organize service opportunities in large and/or small groups, throughout the Boston Area. We invite women of all faith backgrounds to join with us in friendship and service. You can read about our humble beginnings from 1844 when we were known from the Boston Penny and Sewing Society Newsletter.